8 pairs of tablets for 8 applications A very compact and lightweight multi-use product. 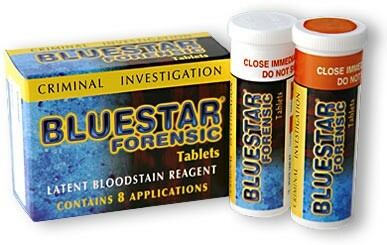 Each pack provides the investigator with the possibility to prepare 8 times 125 ml (4 oz) of BLUESTAR® FORENSIC working solution or up to 1L (32 oz) if all tablets are used together. Pack content : 2 tubes of tablets and the user's manual. The red-top tube holds 8 beige tablets (the reagent) while the white-top tube holds 8 white tablets (catalyst). Pack size : 65 x 47 x 26 mm (2,6 x 1,9 x 1,3 inches) Pack weight : 40 grams (1.4 oz) How to prepare the solution To prepare the working solution, you will need to dissolve a pair of tablets (white + beige) in 125 ml (4 oz) of distilled water in a bottle equipped with a fine mist atomizer. Or use the 8 pairs at once if you need 1 L (32 oz).